After sitting through the Nintendo developer roundtable at E3, which featured Tsunekazu Ishihara and Junichi Masuda of The Pokemon Company and Game Freak respectively, it struck me: much has changed since the Pokemon: Red and Blue days. I'm not just talking about how there's a new fairy type now, either. I'd like to think I'm not a slave to nostalgia; I think modern Pokemon games are great and I love where the new, sometimes absurd designs, are going. The early games hold a special place in my heart by virtue of being my introduction to the series, but that doesn't mean I think they're better. Don't get me wrong, I love them, but god, the early games were hugely imbalanced, I strained my eyes without a backlit screen, and the older sprites don't compare to the gorgeous color ones we have today. Still, there is one thing I wish hadn't changed from those days. "Pokemon has always been about evolving alongside the hardware to better promote communication between players so they can enjoy the core elements of Pokemon—which are really collecting, battling and trading," Ishihara explained during a segment of the presentation that focused on connectivity in Pokemon games. You can see that dedication to connectivity when you take a look at how innovative the idea of trading was in Pokemon Red and Blue: most uses of the Nintendo Game Link cable at the time focused on competitive play. The Game Link cable might've helped the fact that Game Boy bricks couldn't wirelessly connect with one another, but that cable fix did something wonderful: it forced you to connect with other people in person. 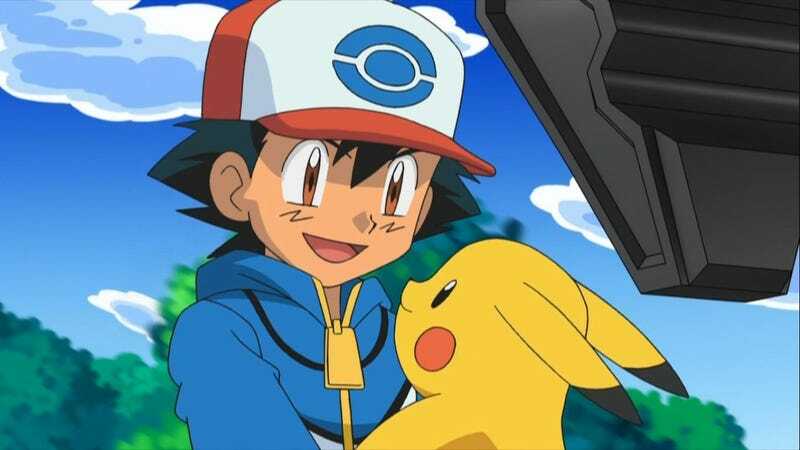 It's technology that encourages friendship—which is perfect for a game like Pokemon, which is also all about the power of friendship. The same can be said of the Game Boy Advance wireless adapter: it was a technological shortcoming that required players to be within a certain range, but it was that exact quality that encouraged players to bond with one another. That sort of interaction is a dying breed everywhere but tabletop gaming. I still remember how damned difficult it was to trade or battle other trainers in those early days, though. There were always a bunch of people who had the games, but having the proper gear at the right time limited how often the average person got to play with other people. Compare that to the 80 million trades completed since Diamond and Pearl, which was when Pokemon games started to let players communicate over the internet. And now that Pokemon X & Y is introducing the Player Search System—which allows players to be always connected—collecting, battling and trading has never been easier. And that's exactly the "problem." I won't say the days of Game Link and wireless adapters were convenient. Tech-wise, that stuff is archaic and inelegant compared to being a few taps away from communicating to other players. Yet, it's exactly that ease that has made communication with other players lose the weird charm of having to have all the cables, of having to know someone else that was willing to sit down with you and battle or trade face-to-face. Collecting, battling and trading has never been easier. And that's exactly the "problem." So no, I don't believe that having easy access to all Pokemon is inherently a good thing. How much does a Pokemon like Machamp, or any other Pokemon that only evolves when you trade it, mean to me when I can easily acquire it? I can still list out the Pokemon I traded in the older games; it was so rare then that any trades were memorable events. I still remember the first time I brought my Game Boy Color to school and traded my Charizard for a Pikachu—only to get my handheld confiscated because they weren't allowed in school. I've traded and battled dozens of times over that amount in the newer games, which is great—but I can barely recall any of it. That's because connecting from the comfort of your home rarely results in memorable stories. If the Pokemon games are about fostering powerful relationships with my Pokemon and with other trainers, then the ease of trading is in direct opposition to that. My Pokemon have become easily tradeable data, critters which have more in common with the stock market than a puppy or friend. Most trainers online, meanwhile, are nothing more than a means to test my own strategic wit. Bonding not necessary. I'll still use the PSS system, of course. I'm not going to pretend I don't take advantage of how easy the games make it for me now; I do. But for a franchise that is all about connectivity, it's a shame that that connectivity seems to have become less meaningful.